It may seem like time screeches to a halt when you get a pimple. But the truth of the matter is that the breakout that shows up on your face is the end result of a cycle that started weeks earlier when your pore became clogged with dead skin cells. Oil then collected in the pore creating a playground for p. acnes bacteria to feed and breed, which led to the throbbing, red, tender bump that is making your day miserable. Take care of your skin and stop chasing pimples: You brush all of your teeth every day, not just the ones that have cavities, so why not treat your entire face instead of the pimples that you can actually see. Our Combination Therapy approach is a preventative strategy that provides you with a complete, multi-step skincare regimen including cleansing, toning, and hydration together with acne-fighting medicine. These acne-fighters attack acne at every stage of the cycle, helping to stop current breakouts in their tracks and new ones from forming. It’s recommended by dermatologists for a reason — it works! Proactiv was the ﬁrst company to revolutionize healthy skincare with this comprehensive approach. We have always found that this preventative strategy delivers superior results for our customers. Each of the lines in the Proactiv family uses the Combination Therapy approach to help you address your skincare needs. To get the healthy-looking skin you’ve always wanted, try Proactiv today and see the difference Combination Therapy can make for you. Clear acne with the power of Rx, without a doctor’s visit! After 30 years as a prescription-only acne-fighter, the clinically proven retinoid Adapalene takes center stage in our newest innovation – ProactivMD, the complete healthy skin regimen which includes cleansing, toning, hydration and sun protection, all in one easy-to-use system. Deep Cleansing Face Wash - A gentle liquid cleanser formulated to help clear dirt and debris from deep within the pores. Adapalene 0.1% - Adapalene is a topical retinoid medication used for the treatment of acne in people age 12 years and older. 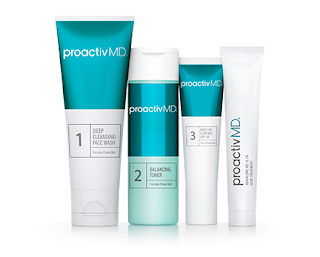 Get clear skin with Proactiv's New ProactivMD® Essentials System! Many teens are gearing up to head back to school but many not be all that excited due to breakouts. I know when I was a teen and even now, breakouts definitely get me down. Breakouts really play with your self esteem and with summer here I often find that I have more breakouts than usual due to all the sweating from our lovely 100+ degree days. I began trying Proactiv's New ProactivMD® Essentials System almost 2 weeks ago and I'm completely blown away with the results. My acne has all but vanished and my skin has a healthy glow about it that I haven't seen in awhile. My skin looks healthy and clearer than ever before. I'm excited to see what the next few weeks hold as I expect to see even more improvements. 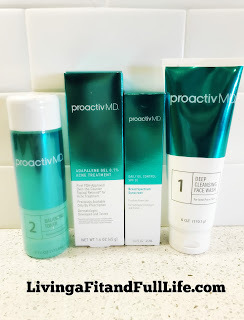 Proactiv's New ProactivMD® Essentials System is amazing and should definitely be on the back to school shopping list if you or your teen suffer from acne! Click HERE to learn more about Proactiv! Follow Proactiv on social media!